Psolka Photography Blog - Creating powerful imagery to fuel your marketing message. Psolka Photography – Creating powerful images to fuel your marketing message. We were pleased to recently be asked to photograph a pre-designed theater project by Acoustic Smart. The 5-month project was created together with Connect Consulting, who was responsible for the electronics. We’ve photographed a lot of theaters over the years and never get tired of them. They’re some of the nicest rooms in the house and it’s great to see how different tastes and approaches create different styles and experiences of a room. 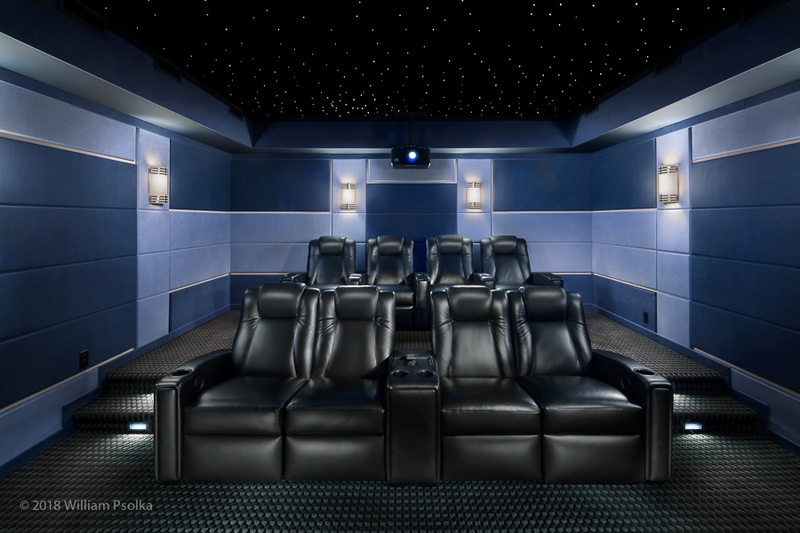 This project was a bit different in that is was a pre-designed theater, designed and built by Acoustic Smart. It was new construction, built with the usual noise barrier and floating walls to decouple vibrations and create an isolated space. The main difference is in the pre-designed aspect of it. The benefit being that it uses only acoustic architecture. Sculpted, fabric paneled acoustic treatments are used to create a millwork effect without the cost of expensive millwork. 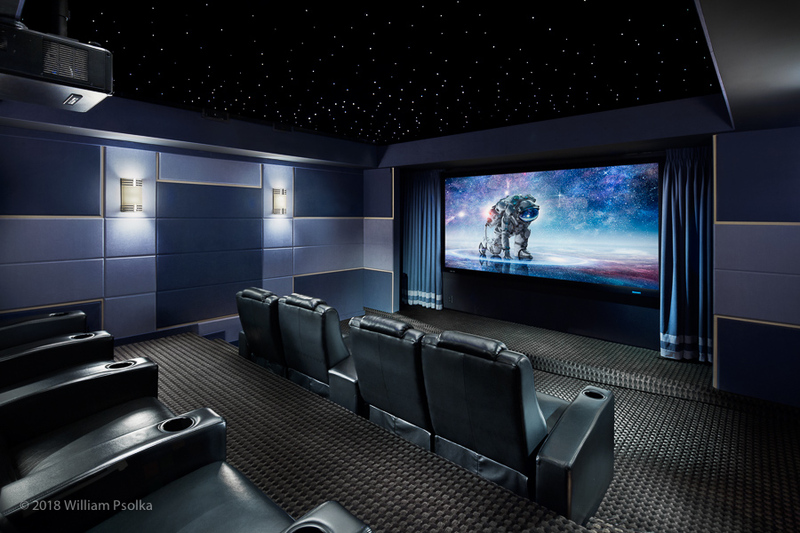 The dual motorized seating makes for a comfortable viewing experience and fiber optic stars, including the big and little dippers brought the cost of this room to between $80k – $100k. We spent an enjoyable afternoon photographing interiors of a small but wonderful residential project for our long-time client EDG (Electronics Design Group) that I wanted to share. I’m constantly amazed at the level of work they do and how they pack so much technological punch into even the smallest space. The kids are off to college and we have all this space… now what? The room that used to serve as the “rec room”, filled with kids playing Xbox, Playstation, Skeeball and hanging out with friends to watch TV, is transformed. 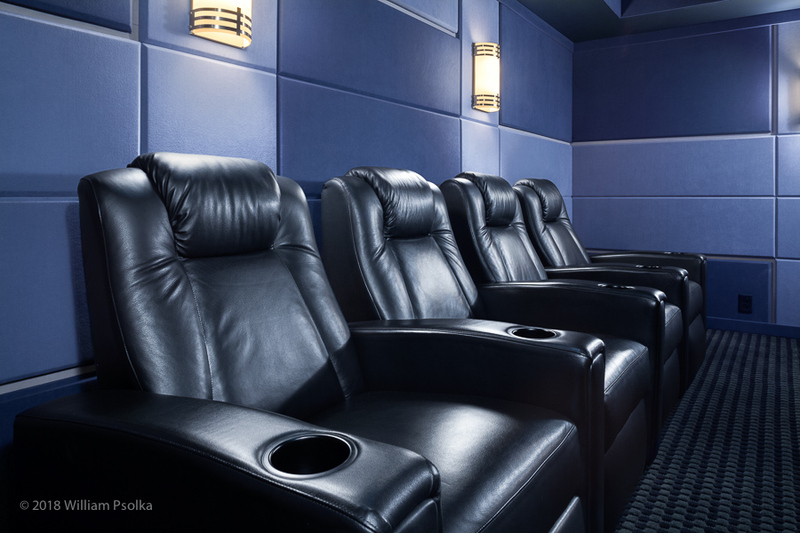 This “chill” media room is an empty nester’s solution of how to best use that now vacant disaster area… I mean “rec room”. 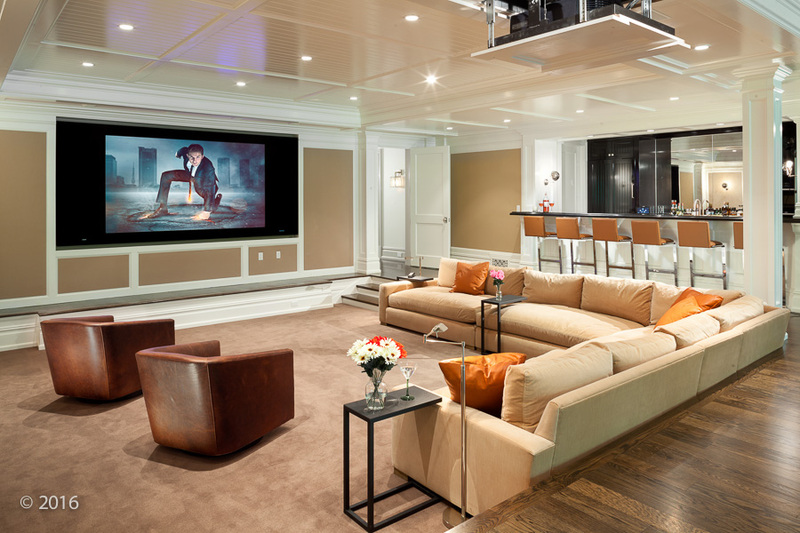 A sanctuary that totally encompasses and allows for the client’s passions… listening to 2 channel audio, watching films, reading and enjoying the open air lower deck. A true multi-purpose media room with great ambiance. 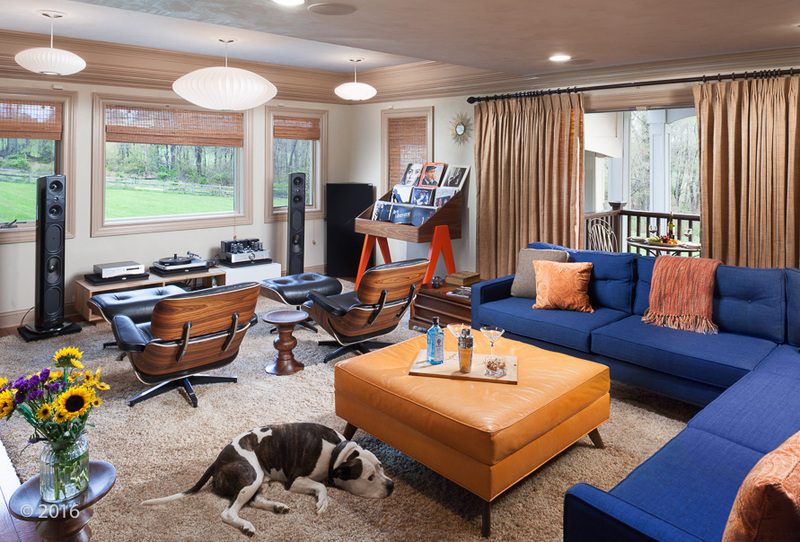 Emphasizing function over form, the room sports some great elements, including a funky record stand, retro clocks decorating the walls, Eames listening chairs and attractive, but visible acoustical panels, bass traps and diffusers. 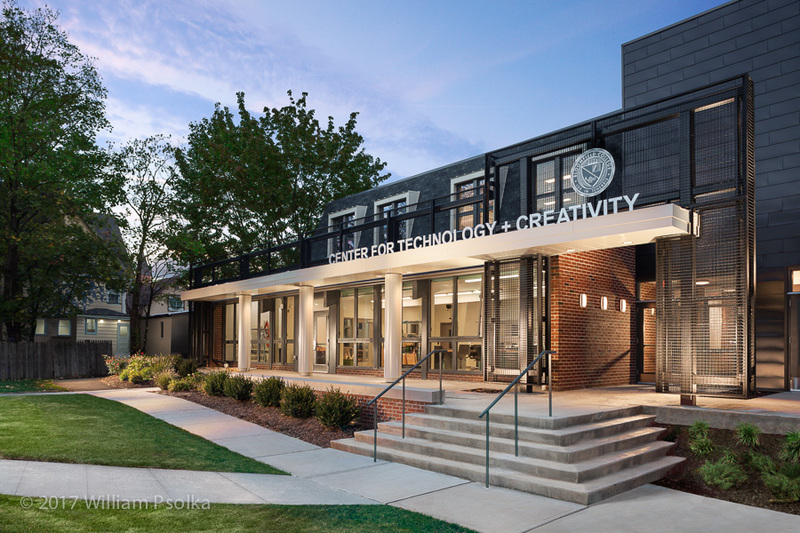 Bloomfield College has undergone some changes over the past few years, including the most recent Creative Commons facility. The project was a complex undertaking and we were pleased to photograph it at its final completion. We were also lucky enough to attend a recent scholarship fundraising event and get a window into the profound impact the college has on many of its students lives. 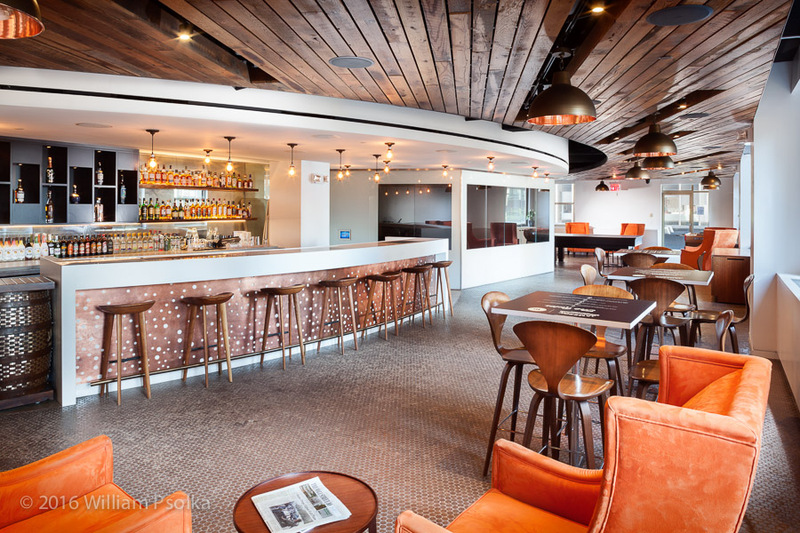 The Creative Commons project was photographed for long-time friends and clients, Fallon + Pacheco Architects. As always, their sense of space, style and color has resulted in a beautiful final result. Since there was a substantial amount of work done, we photographed the spaces on separate days, months apart. 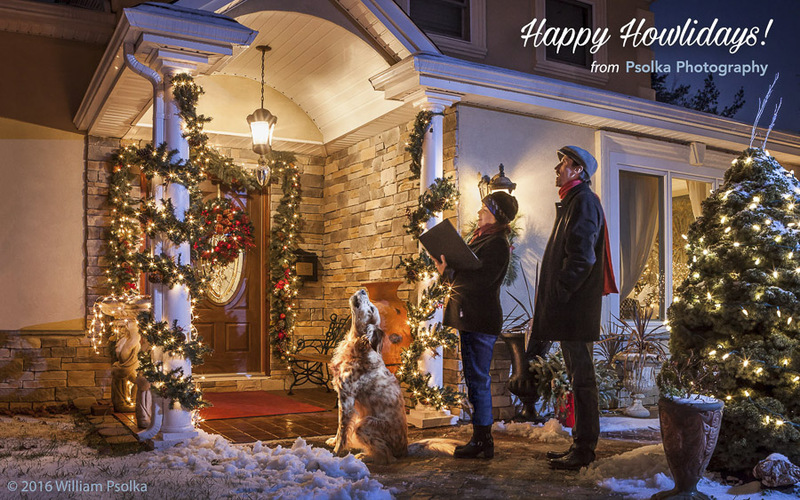 Psolka Photography – Creating powerful images that fuel your marketing message. Well, the leaves have almost all touched down and the birds are heading south. Time to post a few projects we’ve done over the past few months as we brace for winter. When you want the ability to entertain a large number of guests, both indoors and outdoors, along with not missing any sporting events, you want whole house integration. That’s exactly what this client requested from Electronics Design Group. EDG has specialized in design and installation of cutting edge technology solutions for over 25 years. With 69 national industry awards for technical excellence and innovation, they have covered a lot of ground. As a longtime client, we were pleased to photograph this project for them and as always, had a hard time leaving. Once again we’ve had the pleasure of photographing another of V. Paulius & Associates‘ specialty construction projects: An electron beam (or E-beam) irradiator facility built for STERIS Applied Sterilization Technologies. It’s different from the last Steris facility VPA designed for the company, which utilized radioactive material in its sterilization process. We decided that a family holiday card was the way to go this year. Once again, Ollie (our English Setter) gets a starring role. And for the curious, he really was howling. So since the crush of the holidays has mostly passed, we’d like to take this moment, as we relax during “Twixtmas” or “Romjul” or whatever you call this week between the holidays, to say Thank You. We sincerely thank those of you who are our clients, for the continued and valuable relationship we’ve enjoyed over the years. We look forward to continue working together to produce ever more stunning images for your best and brightest projects. For those of you who are not yet clients, we look forward to the opportunity of working together with you in the future and enjoying the same collaboration and success. Have a terrific New Year! We’ve all heard of “brand perception.” It’s the way customers see your company, which is not necessarily what you tell them about it. It’s also those intangible things that create an impression in their minds about who you are, how well you know your business, the quality or consistency of your work and how they will be treated as a customer. These along with many other judgments about your company will be made in the blink of an eye while viewing your website, Linkedin profile, or any other marketing pieces you publish. Whether it’s good or bad, we are always making an impression. It’s a wise investment to make it a good one. We know that images are extremely important in spreading brand awareness through social media. One statistic says that Tweets that include photos and links receive 150% more engagement. We are a visual society and people are much more visually sophisticated today than ever before. It amazes me when I see companies still using websites that were probably built in the 1990’s, with horrendous design and amateurish, outdated photos. There are actually more sites like this out there than you’d think, unwittingly broadcasting a mediocre message to the world. Some might feel they’re too busy to sink time, effort and money into improving and updating their brand perception, but when slow times come, they may wish they had. All that time not spent on putting out a strong message is time lost to the damage done by a weak message. Although it’s easier said than done, when we are busy is when we should be marketing. We all have our areas of expertise – image makers, designers, builders, etc. We can’t be expert at everything. But we need to put forth quality on every level. The difference between professional and non-professional work is a clear one to our customers, and should be something we underscore in our brand perception. 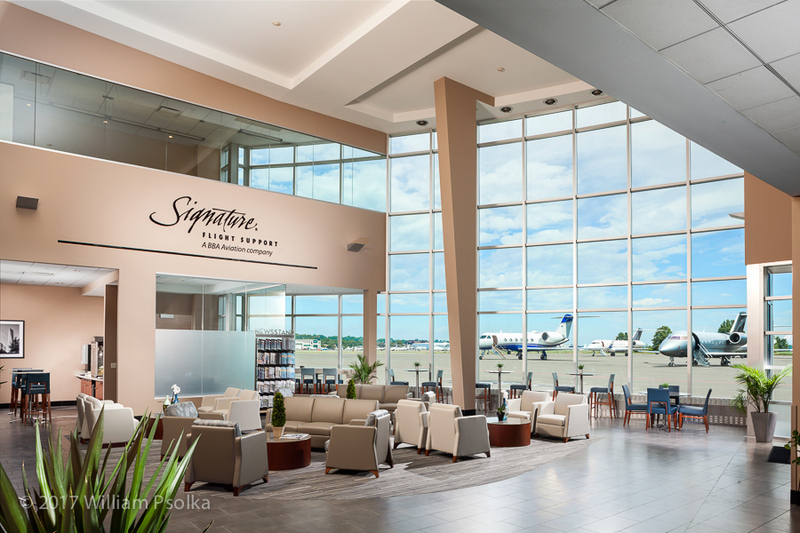 As we say goodbye to summer and move into a busy fall, this is an ideal time to reexamine our marketing message and consider enhancing the visual component with fresh and compelling new imagery. Port Carteret warehouse photographed by Psolka Photography, designed by V. Paulius & Assoc. It’s surprising how visually interesting a warehouse can be. Especially when you see the work that goes into the design and construction of it. It’s utilitarian nature is what usually comes to mind, however, there is much more to appreciate if you look. 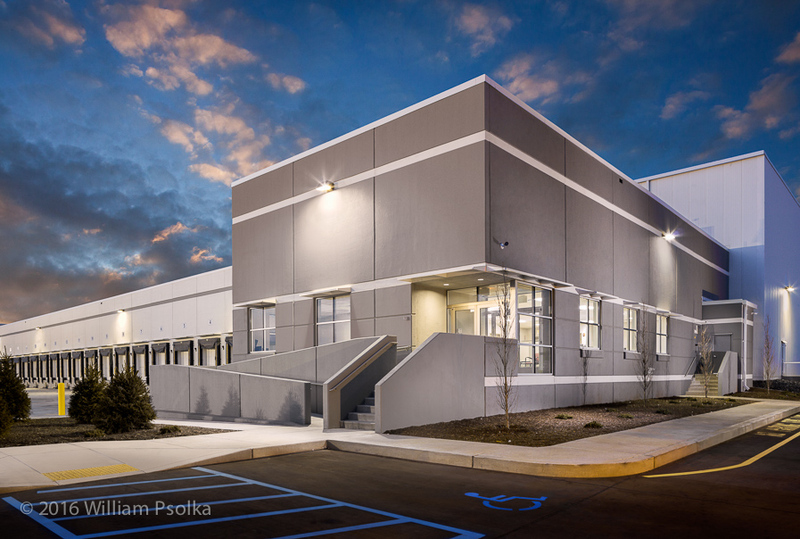 V. Paulius & Associates asked me to photograph this recently completed cold storage warehouse in Port Carteret, NJ. Construction took about 18 months and required 7,900 cubic yards of concrete for the entire project. 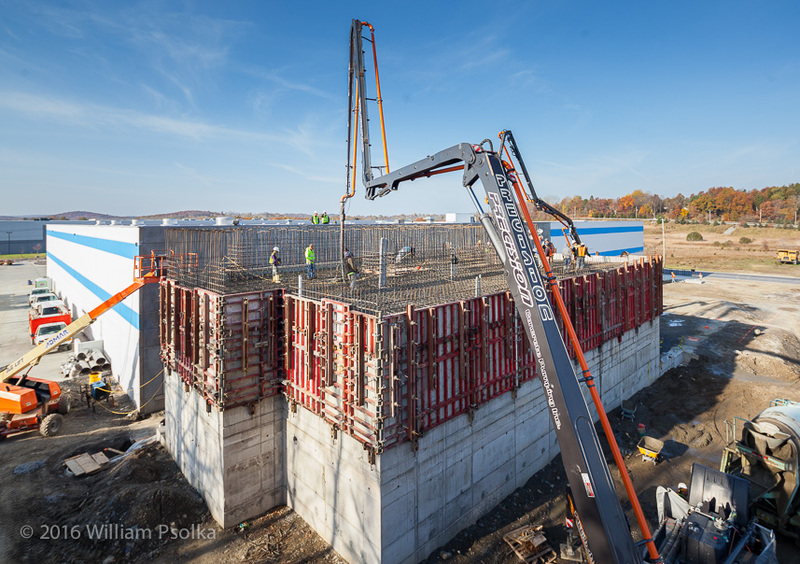 In addition to photographing the completed project, it was also decided that we photograph the pouring of the 9 inch thick, “super flat floors”, which was a crucial component of the overall design and construction. S & S Concrete Floors Inc. placed the concrete, which was an “in-house” custom mix that included steel fibers to aid in temperature and shrinkage reinforcement. It was placed via conveyor belt to maintain slumps of less than 5 inches and the strike-off was done by laser screed machine. Once the floor was firm, it was power floated and troweled to achieved a burnished finish. For their effort, V. Paulius & Associates won an award from the NJ Concrete Awards for “Super Flat Floor”. Not your usual sombreros and ponchos, 10th Ave. Burrito brings a different taste of Mexico to Red Bank, NJ. Owners Brian Katz and Mike Gilson worked with Architrave Group to re-envision the former location of “Fixx”, a longstanding night club, as a second 10th Ave. Burrito location, the first of which was established in Belmar, NJ. The existing night club was removed and a new design was provided to alter the facility to reflect a southwestern design and decorative elements. 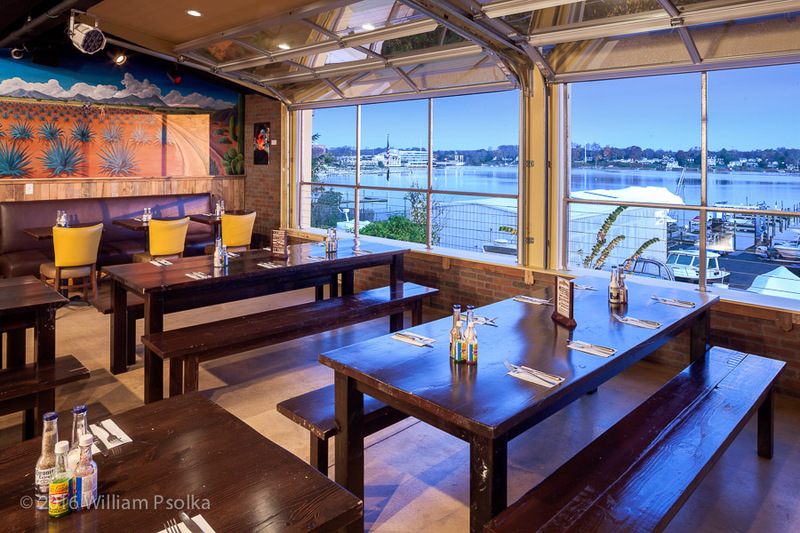 Psolka Photography was commissioned by Architrave Group to capture the new look and feel of this unique restaurant.